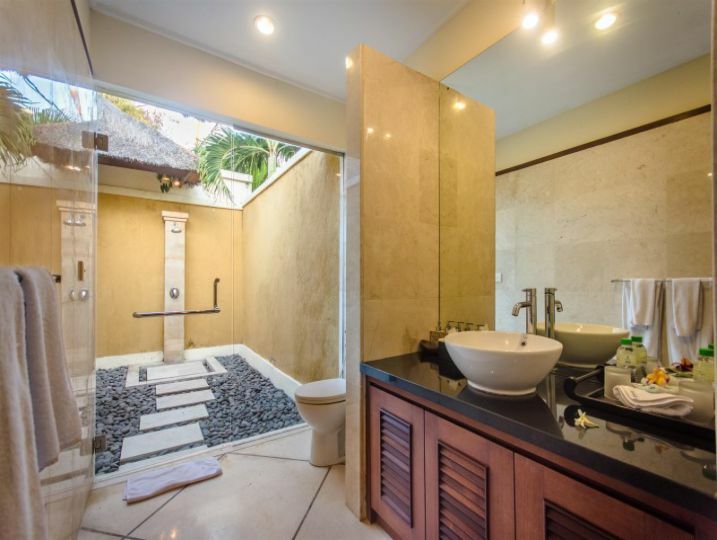 These villa is a private villa Seminyak Bali. 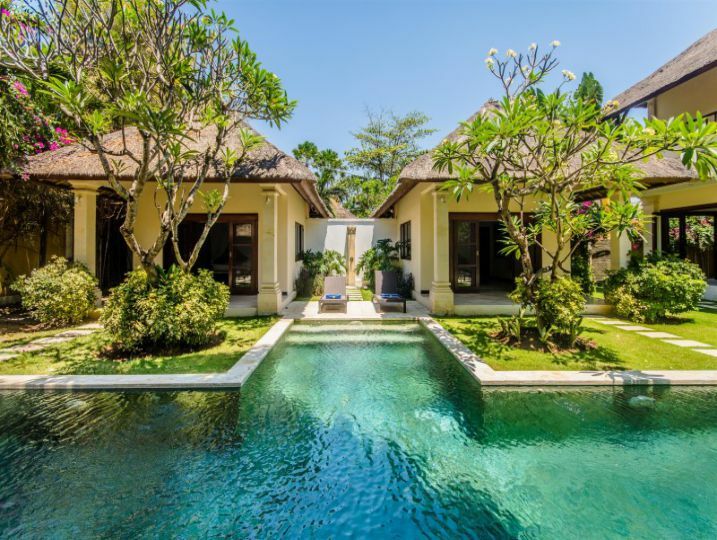 These villa is proving to be one of our more popular villas, due to its location, size, and ambience. 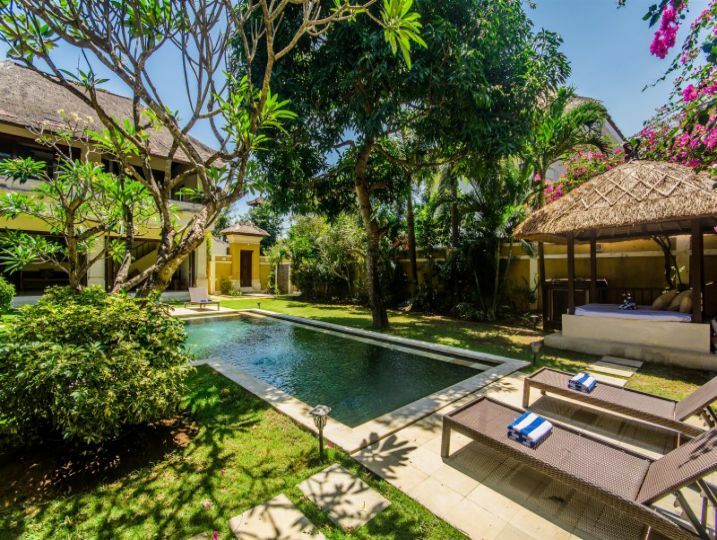 These villa is an oasis nestled in a quiet lane but conveniently only a stroll to everything you’ll need to make your holiday perfect. 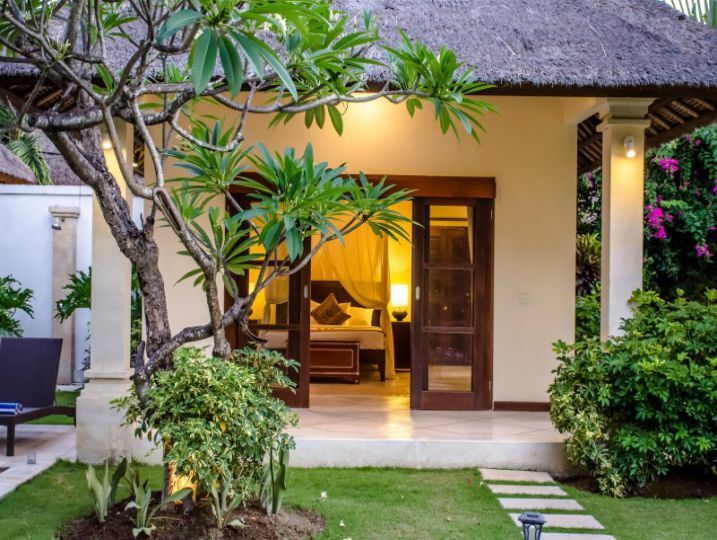 Once you step through the traditional Balinese gate, over the tropical fish pond, you get a feeling for how spacious this villa is – both in the grounds, and the buildings. 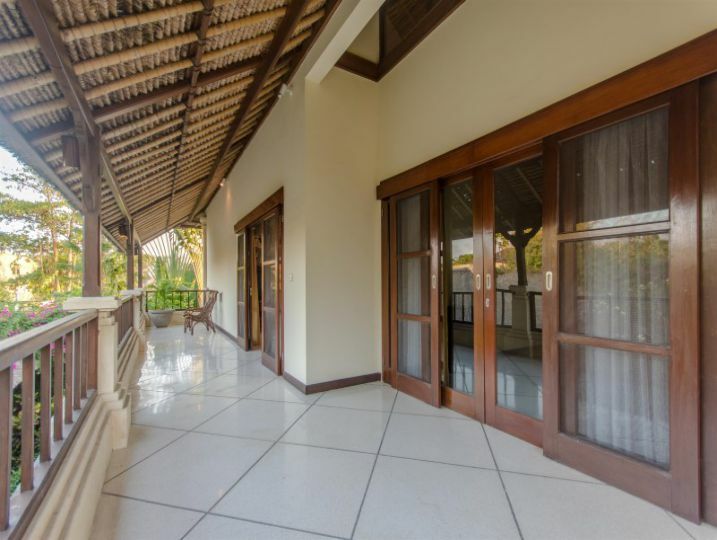 It has 2 levels, with 2 guest houses also separate from the main building, and the living and dining areas downstairs from the master bedroom, giving distinct living areas, perfect for families who enjoy being together, as well as some private times. 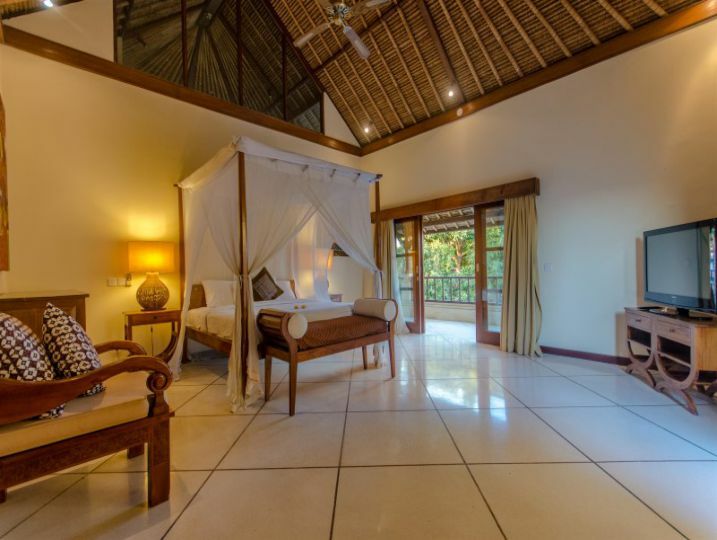 The main building in this villa is a two story building housing the kitchen, dining room and living area downstairs, as well as the huge king sized bedroom and ensuite upstairs. The wooden carved sofa in the master bedroom is dressed with colorful pillows. 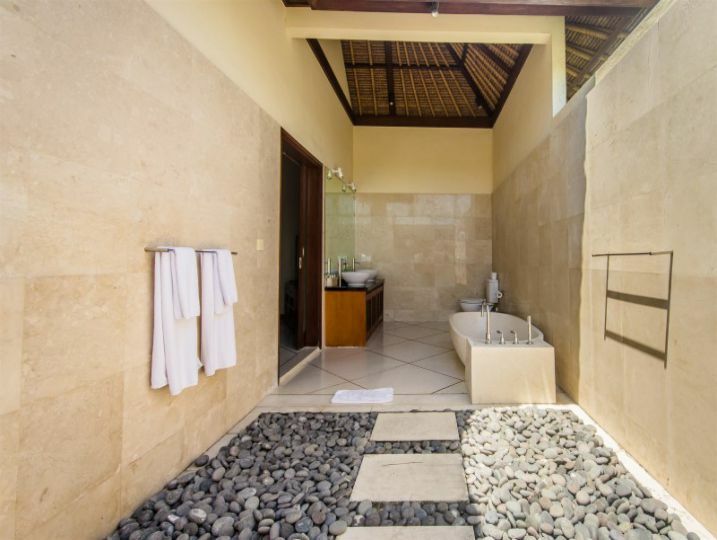 Within this open-plan area is also a kitchen, fully-equipped with all the appliances and utensils you may need during your stay, as well as a breakfast bar with stools. Next to the kitchen is a large dining table for your dining convenience as a family or group of friends. 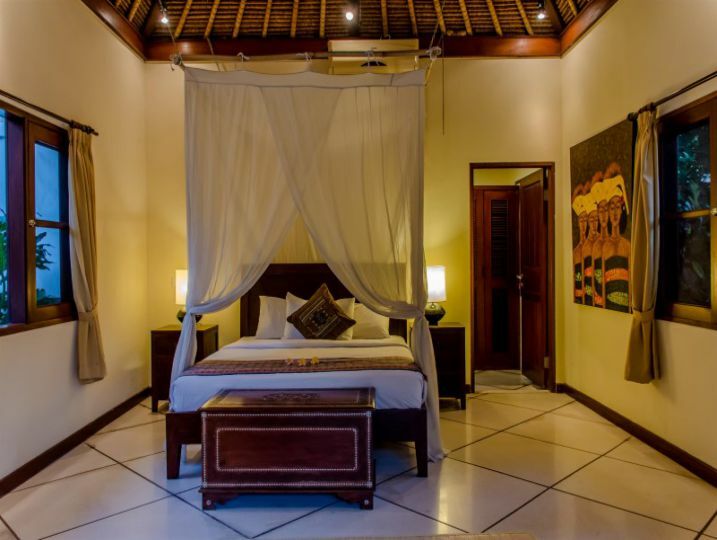 The villas ambiance is very charming, intended to ensure a homely feeling. 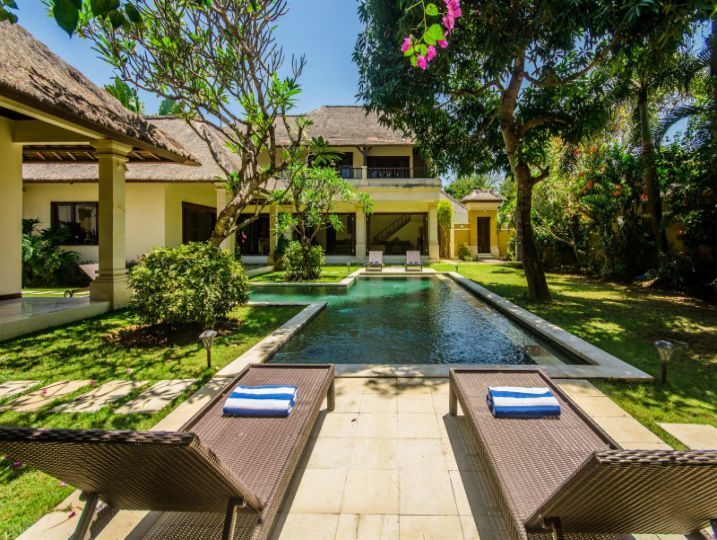 The grassy grounds surrounding the pool of this villa create a calm and peaceful place to relax. 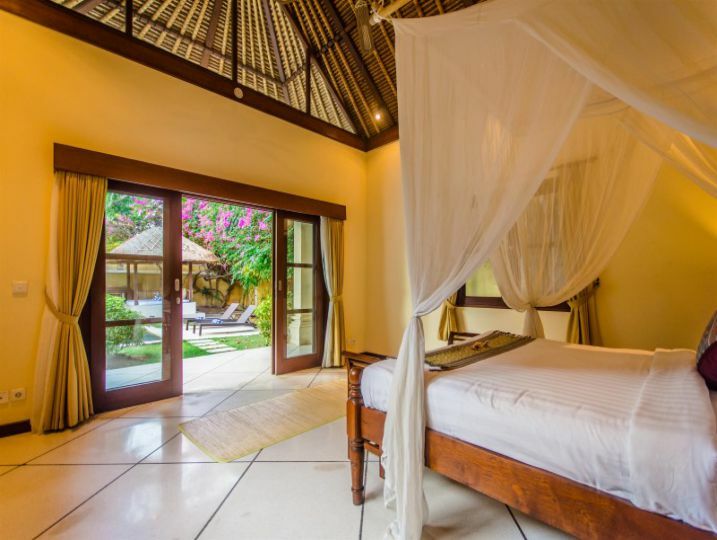 There is a pavilion housing a daybed in one corner of the grounds, with a fan in order to keep you cool in the tropical climate. As you enter the ground of the villa you pass over stepping stones placed over the tranquil fishpond. There are also sun loungers for those who prefer to soak up the sun during their holiday, and plenty of shade for those that prefer to keep their cool! Main Living Area (Open-air living area, Ceiling fan, Television with international channels & DVD player). Bedroom 1 (Semi-outdoor ensuite bathroom, King size bed with mosquito net, Air-conditioning & ceiling fan, Toiletries, Wardrobe, Terrace outside bedroom). Bedroom 2 (Guesthouse (stand-alone) style, Semi-outdoor ensuite bathroom, Queen size bed, Air-conditioning & ceiling fan, Toiletries, Wardrobe, Terrace outside bedroom). Bedroom 3 (Guesthouse (stand-alone) style, Semi-outdoor ensuite bathroom, Queen size bed, Air-conditioning & ceiling fan, Toiletries, Wardrobe, Terrace outside bedroom). 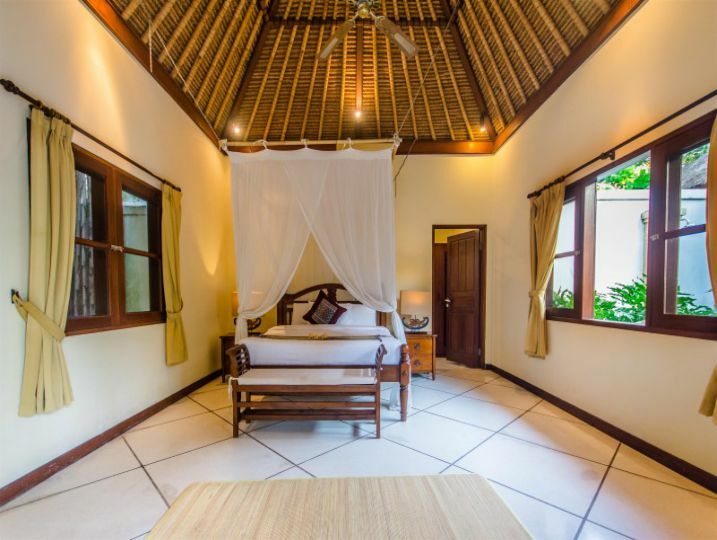 Bedroom 4 (Guesthouse (stand-alone) style, Semi-outdoor ensuite bathroom, Queen size bed, Air-conditioning & ceiling fan, Toiletries, Wardrobe, Terrace outside bedroom). Bedroom 5 (Guesthouse (stand-alone) style, Semi-outdoor ensuite bathroom, Queen size bed, Air-conditioning & ceiling fan, Toiletries, Wardrobe, Terrace outside bedroom). 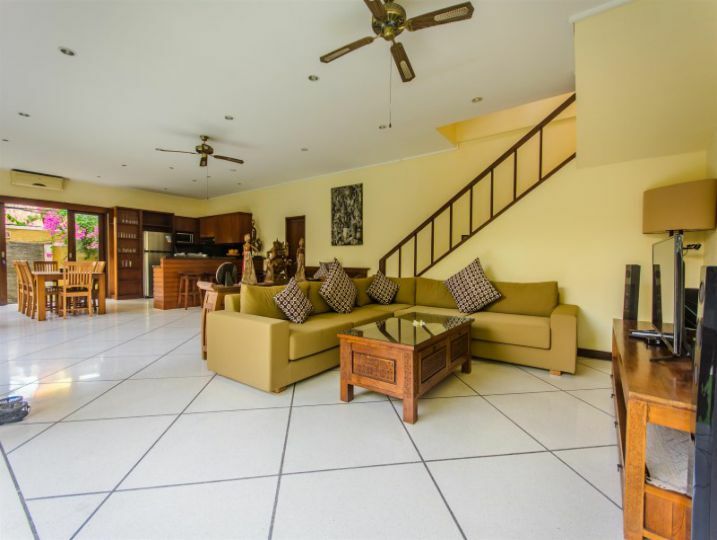 Kitchen and Dining (Open-air kitchen & dining area, Fully equipped kitchen, Cutlery, chinaware & glassware, Water Dispenser, Toaster, Blender, Microwave, Full-size refrigerator with ice cube maker, Coffee machine, Dishwasher). Miscellaneous (Safety deposit box, Iron & ironing board available, Baby cot available, Back-up power supply (e.g. Generator)). 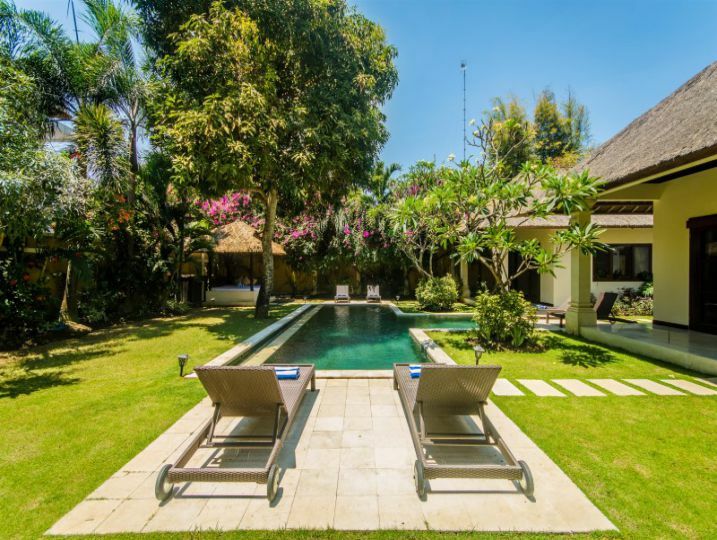 Swimming Pool Area (Private swimming pool, Bale’ (small Balinese gazebo), Poolside sunlounges). Airport transfer (arrival only), Welcome drink upon arrival, Free Wi-Fi, Drinking water, Housekeeping service daily, Grocery shopping assistance. 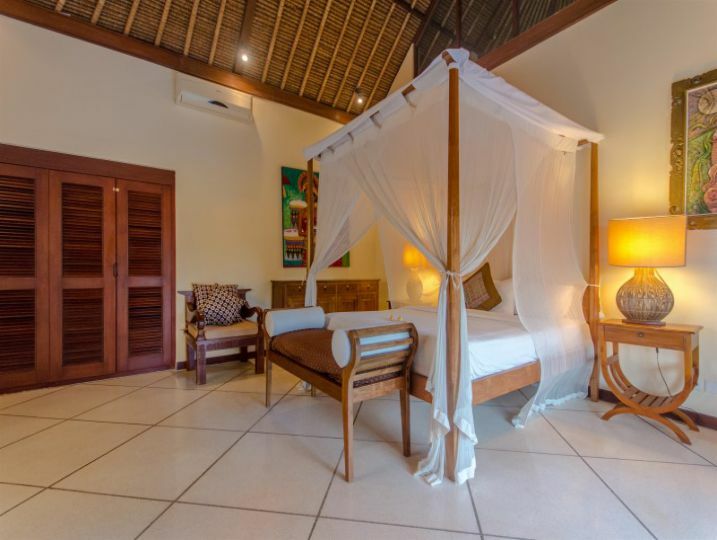 Villa Cemara – 5 Bedroom is available for selected dates.